« Next Article: Come on in and check out our new school building in MADRID! 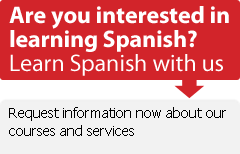 Eager to learn Spanish expressions? Here's the blog you're looking for! Every month I surf my way across the web and through the refraneros we keep around the office, searching for the "expression of the month" to be published in don Quijote's monthly newsletter. Today I stumbled upon a fabulous resource: a blog of Spanish expressions and commonly heard idioms, entirely in Spanish. The writing is clear and down-to-earth and, with archives from as far back as January 2007, the site offers an extensive library of Spanish expressions. This is a great resource, Erin. Thanks for telling us about it! !